Dentistry – Locum Tenens (Temporary) Dentist – Gregory Cole, D.D.S. Even with the controversy and court actions, this is good news – for every person who tries to quit = the better. Graphic and/or emotional television anti-smoking ads get more smokers to try to quit than less intense ads, according to a new study in the American Journal of Preventive Medicine. “Harder hitting ads worked equally well, regardless of how much you wanted to quit, how much your income is and your level of education,” said Matthew C. Farrelly, Ph.D., chief scientist at RTI International in Research Triangle Park, N.C., and lead author on the study. The study evaluated the impact of anti-smoking ads run by the New York Tobacco Control Program from 2003 to 2011. Smokers were surveyed about their smoking habits, their recall of anti-smoking ads, their desire to quit and demographic information, such as income level and race. Researchers looked at media market data and determined that the survey participants were exposed to an average of three emotional or graphic anti-smoking commercials and three comparison ads per month during that period. Comparison ads advocated or encouraged quitting but without strong emotional content. The survey found that current smokers who recalled seeing at least one emotional or graphic ad were 29 percent more likely to have tried to quit in the prior year. Exposure to comparison ads did not increase quit attempts. If the goal is to get smokers to try to quit, ads need to evoke a strongly negative reaction to smoking, the authors concluded. Here is a video that has played on California television. It is shocking, but if it can prevent one more case of smoking induced cancer…. Undoubtedly this smoking flap will be headed to the United States Supreme Court. A US court on Friday shot down orders to slap graphic anti-tobacco messages on cigarette packs, saying the government overstepped its authority by trying to “browbeat” smokers into quitting. 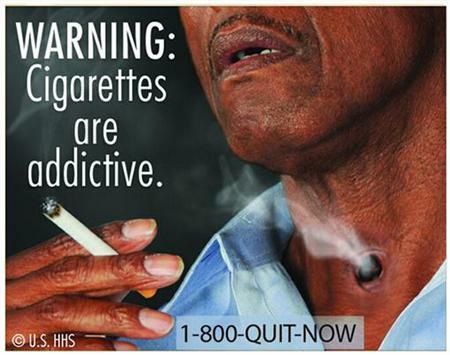 In line with campaigns in several other nations, the United States planned from September 22 to require images on cigarette packs including a man smoking through a hole in his throat and a body with chest staples on an autopsy table. “They are unabashed attempts to evoke emotion (and perhaps embarrassment) and browbeat consumers into quitting,” Judge Janice Rogers Brown, who was appointed by former president George W. Bush, wrote for the majority. She also said that the US Food and Drug Administration “has not provided a shred of evidence” that graphic warnings directly reduced rates of smoking. The graphic ads, as I have said before, don’t really bother me. I, also, don’t think anyone will be deterred from smoking because of them. Hopefully, the entire flap will be moot as more and more Americans abandon the smoking habit/addiction. 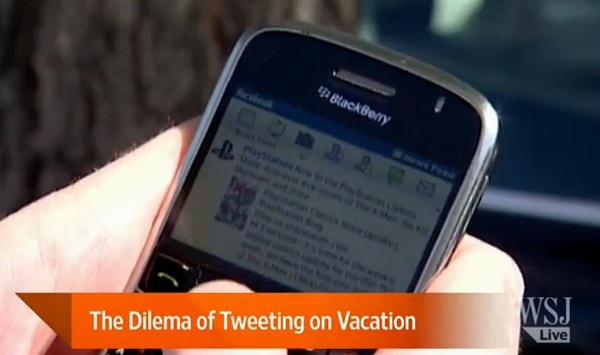 Should You Tweet While on Vacation? I know I Tweet and Facebook, too. Your followers almost expect constant chatter and smart phones really make it easy.